He is extremely knowledgeable on martial arts, tries to teach us as much as possible in every class and is very patient. I highly recommend his classes to everyone (especially ladies) who seek ways of protecting themselves in life threatening moments. Thank you Sunrise Martial Arts. Not only did I pick up some very cool skills, I had a blast. Grant teaches useful techniques and makes it fun! He is very patient with his students and takes the time to explain things and correct you if you need help. He truly cares that you learn how to protect yourself. I highly recommend taking his classes. Located steps away from Yonge & Bloor subway station and with parking nearby, arriving at Sunrise SMA is easy and convenient. Showcasing private change rooms with showers, fitness & training equipment, full size mirrors, heavy bags and a boxing ring, Sunrise SMA will maximise your martial arts development. Inspired at the young age of 15 by international film and martial arts star Bruce Lee, Grant Sawyer began his martial arts training in 1975 in Shotokan Karate, soon acquiring the rank of Black Belt. In June 1990, he began formal instruction of Bruce Lee Jun Fan’s art of Jeet Kune Do Concepts under Master Makoto Kabayama, 24th generation of the Kabayama Bukei, samurai descendants. 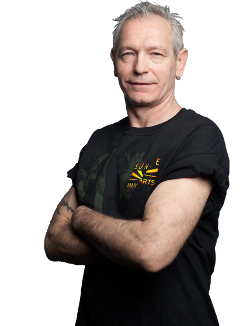 Grant has assisted Makoto in numerous seminars which focused on Jeet kune Do Concepts, Filipino Martial Arts and Women’s Self Defense, including self defense workshops for paraplegics held regularly at the Lyndhurst Centre in Toronto. Graduating as a Full Instructor of the Kabayama Bushidokan & founding member of the JKD Family in 1996, Grant opened Sunrise Martial Arts, a school dedicated to personal development and the sharing of the arts of Jeet Kune Do Concepts and Filipino Martial Arts, Kali and Silat. Over the years, Grant has studied intensively under world renowned Dan Inosanto of the Inosanto Academy, best friend and training partner to the late Bruce Lee, the late Larry Hartsell of the Jan Fan/Jeet Kune Do Grappling Association, one of Bruce’s original students and martial arts Hall of Framer, Phil Gelinas of the GAMMA Academy. In 1999 Grant received Full Jeet Kune Do Concepts Instructorship under Paul Vunak of Progressive Fighting Systems, past combat instructor to the Counter-Terrorist U.S. Navy SEAL Team Six. At the age of 46 Grant competed in the 2006 Canadian WEKAF Qualifying Tournament, winning Gold in Single Stick Sparring and Silver in Double Stick Sparring. Currently, Grant teaches JKDC, FMA and MMA out of his Toronto based school, Sunrise Martial Arts/SMA and runs a variety of workshops and self defense seminars both locally and internationally. Designed by John Vivian. Copyright 2017 Sunrise Martial Arts.